Steve and Carol Girard founded Girard Winery in the Pritchard Hill area of Napa Valley in 1980 and were known for producing flavorful Cabernets and Chardonnays, but they fell in love with the Pinot Noirs from Oregon. Steve believed Oregon's Willamette Valley offered the ideal climate for world class Pinot Noir, but he had no desire to own two wineries. He did truck south grapes from Oregon to make Pinot Noir, but as he put it, "The wines were terrible." Steve and Carol spent two years driving around Oregon and decided on an area between Eugene and Corvallis. In 1988 they bought the 1,860 acre Sunnymount Ranch, an old sheep ranch located in the southern Willamette Valley near Monroe which straddles both Benton and Lane counties. Planting commenced the next year. The vineyard is predominantly planted to Pinot Noir with seven clones on a variety of rootstocks. The estate 140-acre vineyard uses a combination of sustainable, organic and biodynamic farming methods. 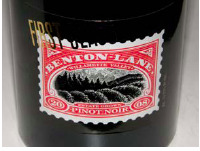 Benton Lane employs pneumatage to manage the cap during fermentation, avoiding punch-downs and punch-overs. Pneumatage uses air bubbles injected into the bottom of the tank to slosh the cap and stir the pigments and body into the liquid. Steve feels that pump-overs and punch-downs tear the grape skins, unnecessarily releasing the bitter and tannic seeds into the unfinished wine. 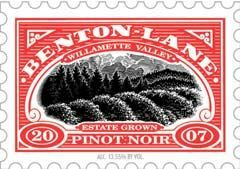 Benton Lane Wines have a distinctive stamp image as a label. Two Pinot Noirs are produced: a value-priced estate grown Willamette Valley Pinot Noir and an estate grown First Class Willamette Valley Pinot Noir, only produced when a special lot of wine becomes available. The wines, including a Pinot Gris and Pinot Blanc, are distributed in 49 states and several international markets, and are available online.